What did George Sperti have to do with America’s obsession with supplements? The long, winding tale of a clever young UC engineering student, a nation fighting rickets, and a little money-maker called vitamin D.
Harriette Chick left England for Vienna to make small, twisted skeletons straight again. Rickets, a disease that causes soft and bent bones, curved spines, bowed legs, “pigeon” chests, and malformed teeth, was warping the bodies of poor urban youngsters in the autumn of 1919. Frail children had packed the University of Vienna’s Kinderklinik. Rickets was a mystery. The Vienna clinic’s director, Clemens von Pirquet, believed it was an infection passed from child to child, like tuberculosis, and that poverty, urban crowding, and lack of decent food in the aftermath of World War I had lowered resistance. But treatment proved frustrating; some children seemed to recover while many did not, and Pirquet was unable to explain the difference. Chick, an inquisitive nutrition expert, had seen many cases. Often called “the English disease,” rickets had become common in cities in the northern hemisphere since the Industrial Revolution; by the early 20th century, some estimates put its incidence among children in New York’s teeming, tenement-bound immigrant population at 90 percent. After spending two years testing diets and therapies, Chick and members of her team proved definitively that the disease was not an infection. It could be prevented, even cured, they found, by two things: One was cod liver oil. The other was sunshine. Both curatives, especially sunshine, already had a history. In the late 1800s, sick people in Germany and Switzerland were sometimes sent into the mountains to take high altitude sunbaths. Organizations like the English Sunlight League promoted clear skies so the sun’s beneficial rays would no longer be obscured by coal smoke. In 1901, an American named Peter Cooper Hewitt invented the quartz-mercury vapor lamp, which emitted a spectrum of light like that of the sun; a German physician modified the design in 1911, creating the Alpine Sun Lamp. Promoted as a general cure-all for any number of ailments, it soon found a place in many doctors’ offices in Europe and North America. But it wasn’t until Chick reported her success to Britain’s Medical Research Council in 1922 that the medical world was convinced the sun prevented rickets. What was it in the sunlight that worked the medical magic? A vitamin. 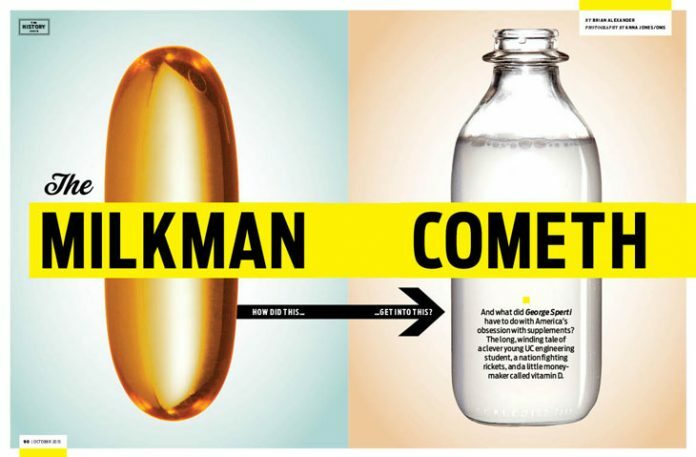 The sun “activated” a substance that came to be known as vitamin D. The discovery of vitamins was itself fairly recent. In the 1890s, a doctor working in the Dutch East Indies successfully traced the cause of a nerve disorder called beriberi to the natives’ habit of eating polished rice—a significant indication that foods contained additional constituents aside from protein, fat, and carbohydrates that were necessary for human health. In 1912, when a Polish chemist named Casimir Funk found the ingredient in rice coatings that prevented beriberi, he called it a “vital amine.” We now call it thiamin, one of the B vitamins. Chick’s discovery added fuel to an already cutthroat race—mainly between scientists in Germany, Britain, and the United States—for practical uses of these new miracle chemicals. By 1930, corporations had joined the race, too, and one hard-charging American CEO found his company falling behind. Edward F. (E.F.) Hutton, a Wall Street financier who made his fortune in the brokerage business, had married Marjorie Merriweather Post, heir to the Postum Cereal Company of Battle Creek, Michigan, and quickly stepped into a leadership role. At the time, Postum was losing the competition for America’s breakfast food dollars to Kellogg’s, its crosstown rival, and Quaker Oats. Hutton had acquired his way out of the doldrums by aggressively taking over other food-related companies, like Jell-O, in the process transforming Postum into General Foods. But cereals were still the company’s main business, and that business was now threatened because Quaker Oats was telling America it had figured out how to put sunshine into food. Up until then, millions of mothers had been spooning cod liver oil—which was expensive, tasted bad, and varied in quality and potency—down the gagging throats of their protesting children. Now, Quaker implied, mothers could hold rickets at bay by serving up a tasty bowl of Muffets. General Foods had known this was coming for years, and feared it. But it had never been able to put sunshine in its cereals thanks to that “under the law” part of the Quaker ad. The process of activating vitamin D in food had been locked up by a patent, and an aggressive cartel had formed to neutralize competitors. In the vitamin D game, Quaker was in and General Foods was out. Hutton was desperate to get in that game, but on his own terms. So he invited an obscure lab director from the University of Cincinnati to New York City for a lunch meeting. Young, handsome, dark-eyed, with a prominent nose and chin, and projecting a degree of self-confidence that made him seem “egotistical and a little naïve,” as one former colleague put it, George Sperti was Hutton’s best shot to beat the cartel at its own game. This is a story of how America fell in love with vitamins and fortified foods, how public universities were transformed into money-making patent mills serving corporations, and how a clever young man, an electrical engineer from Cincinnati born with an ample supply of ambition and drive, became an unlikely celebrity and was hailed as a genius—all because of vitamin D.
In the beginning, fame was the prize in vitamin research, not money. This is why most of the early research on vitamins took place in universities: Scientists were freed from the demands of commerce. Patenting a discovery was taboo. The ethos demanded science for the sake of science, and for the public good. But business soon developed a simple formula: If a little bit of vitamin in food was good, more had to be better. The only way to get lots more in one gulp was with a pill, or by finding some way to add more of it to food. Vitamin D, the scourge of rickets, was an especially good candidate for commercialization because most food didn’t have it at all. With the cultures of business and academia circling each other, it didn’t take long for someone to break the taboo. The big leap came in 1922 when Frederick Banting and Charles Best at the University of Toronto announced that they had treated diabetes with a purified cow pancreas extract called insulin. The two scientists quickly patented their process and gave the rights to the university—which then licensed Eli Lilly and Company to produce insulin for the U.S. and Latin American markets in return for a 5 percent royalty on net sales. Lilly would go on to dominate the insulin market for the next 50 years and grow into a pharmaceutical powerhouse, and the university reaped millions. For American scientists, it was a eureka moment: Suddenly, universities—and select researchers—could get rich. George Sperti would eventually be one of those lucky researchers. But so would the man who ultimately outplayed him in the arena of science and commerce, relegating Sperti to a curious, if still famous, footnote. Though he had a nice-guy reputation among his lab employees, Harry Steenbock zealously guarded his turf. You had to if you worked in the vitamin field. An agricultural biochemist at the University of Wisconsin, he had reason to envy the Toronto scientists. His first push to patent a vitamin discovery had been pooh-poohed by the university. He never forgot the slight. Steenbock shrugged off the criticism. He foresaw big commercial possibilities for vitamin D. With the help of a tough-minded Chicago patent attorney and Wisconsin alum named George Haight, he set up an independent, private, nonprofit business group called the Wisconsin Alumni Research Foundation (WARF). Though not part of the university, its aim was to fund University of Wisconsin research by licensing intellectual property created by university scientists. For the time being, that meant Steenbock, who remained intimately involved in WARF’s vitamin D deals. Quaker Oats was the first; WARF made a secret agreement with the company in 1926. Quaker could experiment with what was being branded as the “Steenbock Process” for small yearly royalties. If the company commercialized a product, it would pay WARF an annual fee of up to $60,000 (almost $800,000 in today’s dollars) once sales began. But Quaker wasn’t the only suitor. M.S. Fine, the research director at Postum (soon to become a division within General Foods), had written to Steenbock about “commercial use…of the patent” shortly after his paper was published. Steenbock and Haight kept Postum in the dark as they cut their initial deal with Quaker Oats, but they quickly realized they’d undershot. Demand for use of the patent was overwhelming. Not only was Postum being persistent but some of the most famous names in American homes—Upjohn, Kraft Cheese, Cream of Wheat, Eli Lilly, Palmolive, Procter & Gamble—were clamoring for rights to the Steenbock Process. John Harvey Kellogg even began a personal correspondence with the professor. a creative thinker, though, and good with his hands, and in 1919 he entered the University of Cincinnati to study electrical engineering. He was not a good student there, either. One professor called him a “dullard.” But he was lucky to have enrolled in a unique program started by Herman Schneider, UC’s dean of engineering. A tireless promoter of Cincinnati industry, Schneider believed companies would be better served if students gained practical experience while attending college classes. It was the birth of UC’s co-op program: Engineering students would work part time at local companies and attend classes in their field. Sperti worked at the Union Gas and Electric Company, where he hatched an idea for a new kind of meter that could more accurately measure large amounts of electricity. He tinkered with the gadget at his mother’s dining room table before enlisting the help of a company supervisor. The resulting Sperti-Blecksmith kilowatt hour and kilovolt ampere demand meter was sold to Westinghouse in 1922 for $30,000. Not only was that an enormous amount of money at the time, the story of the undergraduate underachiever who hit it big was carried in major newspapers and engineering journals. Sperti became a campus and city-wide celebrity and a Schneider favorite—proof positive that co-op education worked. Schneider not only had ideas about education but science, too. He argued that there had to be a set of unifying forces in nature—maybe even just one force—that could explain everything from the atom to the galaxies. Sperti agreed, but with his own twist. He knew what the central force in the universe was: God. A devout Catholic, Sperti viewed nature through the prism of his religion. Years later he would declare that he’d never work with atheists, arguing that any scientific finding from an atheist would be suspect, having been derived from a false premise. Schneider and his protégé formed a team. After Sperti graduated from UC in 1923, Schneider made him a research assistant. Then in 1925, Schneider created what he called the Basic Science Research Laboratory in a tiny attic space on campus to further explore his theories and appointed Sperti a member, despite his lack of an advanced degree (not unheard of in the 1930s). The two co-authored the first report of the lab’s doings in 1926, calling it “The Quantum Theory in Biology.” It was an attempt—visionary, really—to merge physics and biology, something modern science is still busily pursuing. Quantum theory, which was first posited at the beginning of the century, had been widely adopted by physicists who often used light in their experiments. Light radiation, which includes ultraviolet and X-rays, is one of the basic forces of the universe; given the availability of devices like the quartz-mercury vapor lamp to test theories in experiments, it was natural for the new lab to start there. With tanning, meat-packing, and soap-making industries right in town, Schneider, ever the civic booster, set the lab to work investigating how light of varying wavelengths affected bacterial growth on meat, and what it did to yeast and enzymes. Schneider, Sperti, and lab members Robert Norris, a medical student, and Robert Withrow, an engineering student who conducted most of the actual experiments, embarked on a series of trial and error measurements. Like kids with a new chemistry set, they set out to see what would happen to various substances and living organisms when the radiation from the lamps was passed through filters to adjust wavelengths. What they found was that some wavelengths killed bacteria while others didn’t seem to affect the organisms at all. By 1927, Sperti was named director of the Basic Science lab. Though Schneider had declared that cooperation, rather than individual credit, would be the reigning ethos among his scientists, as director it was Sperti’s name that topped all reports and communications. Sperti became the lab’s de facto public face. Was the announcement and the vaguely threatening “selfish alien hands” rhetoric a shot across Sperti and Schneider’s bow? Maybe. But it was probably a general shot across many bows— all the other labs in the U.S. and “alien” Europe working on the problem—and a veiled warning to any company thinking of “perverting” (a.k.a. commodifying) such work. Perhaps Haight figured that since Steenbock’s 1924 patent application had still not been approved, it was time for a reminder. Perhaps, too, the timing in relation to Sperti’s application was mere coincidence. Nevertheless, it stretches credulity to imagine that a Chicago reporter just happened to be wandering by Steenbock’s office in Madison, Wisconsin, and “stumbled” across the story. As Steenbock’s correspondence makes clear, any public statement he and Haight made regarding vitamin D was thoroughly rehearsed. In all likelihood, they were engaging in their primary concern: protecting their property. After U.S. patent No. 1,676,579 was approved in July 1928, the Basic Science lab continued to investigate the role vitamins played in food. Even so, had M.S. Fine, working on behalf of E.F. Hutton and his newly consolidated General Foods Group, been able to strike a deal with Steenbock and Haight, the UC patent may have gone unnoticed. Lucky for them Quaker Oats wasn’t about to give up its exclusive arrangement with WARF. After four years of frustration, Fine at last saw a way around the obstacle. The groundwork was laid at a fabled meeting with E.F. Hutton himself in the exclusive Cloud Club at the top of the Chrysler Building, the shiny Art Deco spire recently erected in New York City. Sperti, most likely accompanied by Schneider, was summoned there by Hutton and Fine in 1930 to meet with a host of General Foods execs and hammer out a deal. It was as if they’d walked onto the set of a Fred Astaire–Ginger Rogers movie. In the Cloud Club’s main dining room, specially designed etched-glass sconces hung on blue marble pillars. Murals of vaporous clouds hovering over idealized fantasy depictions of the Manhattan skyline stretched across the ceiling, reinforcing the belief that, even in the early days of the Great Depression, men like E.F. Hutton and Walter Chrysler were on top of the world. Sperti, who rarely shied away from self-promotion, was no doubt exaggerating. In fact, UC’s board of trustees negotiated with General Foods for months. Still, the deal was extraordinary. For the first time in the nation’s history, a university and a corporation became business partners. General Foods paid $300,000 (about $4.2 million today) into a new company called General Development Laboratories Inc. General Development then paid the University of Cincinnati $300,000 for the rights to the “Light Treatment Process” patent and the rights to “all future inventions relating” to the same field. General Foods could appoint three board members to General Development; the university got two—Schneider and Sperti. The story went on to note the deal between UC and General Foods, stating that General Foods not only planned to use the technique to put vitamin D into its own products and to sterilize foods, but that it would license other companies to do the same, setting itself up in direct competition to WARF. Sperti the inventor and lab manager had become Dr. Sperti, eminent scientist and savior. Like Steenbock, he was becoming a brand. General Foods had every reason to take the gamble of challenging WARF. The Sperti patent was different from Steenbock’s because of its use of “selective irradiation.” And any number of companies could be potential licensees because the country was going D crazy. In the 1930s, Jergens sold vitamin D cold cream. Schlitz produced a vitamin D beer. Lucky Strikes were touted in magazine ads as the more healthful cigarette because the tobacco was toasted with ultraviolet rays. And with its own light ray research lab on UC’s campus, General Foods could have been in a position to make future breakthroughs. But WARF was a determined and tough adversary. It and its licensees heavily promoted themselves as the sole sources of and arbiters for vitamin D, often hailing Harry Steenbock for living on a humble professor’s salary while giving away vitamin D for the good of mankind. The promotion worked. By the mid-1930s, if you wanted to munch the Loose-Wiles Biscuit Company’s Graham Crackers, sip Ovaltine, eat cereal from Quaker Oats or bread made with flour from the nation’s largest milling companies (what is today Archer-Daniels Midland), swallow a Parke-Davis vitamin capsule, or simply drink milk that contained vitamin D, you had to become an indirect customer of WARF. Meanwhile, General Foods began using its new patent as soon as it was able, conducting research in its Battle Creek food labs using the “Sperti Process” and even licensing a Cincinnati-based drug company, William S. Merrell, to create “Viosterol,” a generic name used to designate a vitamin D supplement. In 1934, Merrell advertised “Viosterol (Sperti Process)” in the Journal of the American Medical Association. But Hutton’s original goal of fortifying cereal would go unfulfilled because, in addition to whatever technical hurdles General Foods may have encountered, there was a more formidable one: In 1930, the Steenbock royalties brought in $354,590 to WARF. Eight years later, the Steenbock patents grossed $926,571 (about $15.4 million today). Contrary to WARF’s marketing spin, Steenbock personally raked in $870,711 in royalties between 1927 and 1947 (about $9 million today), an average of $43,500 per year. That was money worth protecting. The vitamin D cartel organized by WARF was divided into product areas. Quaker Oats got cereal. Fleischmann (later Standard Brands) got yeast. A group of producers got evaporated milk. Dairies were selected by region to avoid overlap. Right off the bat WARF licensed five drug companies: Abbott Laboratories, E.R. Squibb & Sons, Mead Johnson & Company, Winthrop Chemical Company, and Parke-Davis & Company. Each agreed to the same royalty fee structure and to minimum retail price fixing so no company could undercut another. Retailers or wholesalers who discounted vitamin D products like Viosterol were blackballed. The five companies met regularly to decide which retailers and wholesalers to work with, which to blackball, and to discuss pricing and other policies. In return for the licensees maintaining high prices and paying the fat royalties, WARF acted as a hidden hand to enforce obedience, settle disputes, and to protect the group from interlopers. WARF’s growing pile of cash, multiplied by agreements with licensees to share legal expenses, meant the foundation could marshal enough funds to strong-arm just about any company. On October 1, 1935, WARF general counsel Ward Ross sent a registered letter to the William S. Merrell Company, demanding that it stop selling Viosterol. When his complaint fell on deaf ears, WARF filed an infringement suit against Merrell’s licensor—General Development Labs. As litigation dragged on, WARF tried to co-opt manufacturers like Merrell. A provision was made to allow more drug companies to be admitted to the cartel as long as they abjured use of the Sperti patent. In the end the matter was dropped, and with it any hope Sperti may have harbored of challenging WARF. WARF eventually attracted the attention of the federal government, which accused the foundation of a conspiracy to keep vitamin D prices high by illegally suppressing competition. The feds joined a lawsuit involving WARF and a vitamin supplement company in California. When the case was finally decided, in 1945, the Ninth Circuit Court of Appeals in San Francisco declared that Steenbock’s patents were invalid. He hadn’t invented anything; he may as well have tried to patent the sun. The decision didn’t matter much. By then the American public had become permanently sold on the value of vitamins and fortified food. And though WARF was stung, the original Steenbock patent was set to expire anyhow. Given the negative publicity, and a Justice Department investigation, WARF agreed to a consent decree: It donated the patents to the public, free for anyone to use. To this day WARF rejects the notion that it created a cartel and denies that it orchestrated price-fixing of vitamin D. So does the University of Wisconsin, where the Steenbock Library displays the professor’s portrait and his books, and a campus marker memorializes the building where he worked. WARF remains the envy of university technology transfer offices across the nation. Its patents have covered everything from the blood-thinning drug Coumadin (also known as Warfarin) to human embryonic stem cells. Even more significantly, it was instrumental in the passage of the Bayh-Dole Act of 1980. Thanks to Bayh-Dole, patents resulting from taxpayer-funded research no longer belong to the taxpayers. Universities and scientists get to keep the intellectual property and license it just as Steenbock did. By 1935, Sperti had left UC. According to William Jensen, a former professor of chemistry who has compiled a history of the department, Sperti and the university “had a falling out.” The details are murky but an article in the Cincinnati Times-Star around that time pointed to disputes over the lab accepting industrial contracts. He wasn’t unemployed for long. A priest who directed UC’s Newman Center connected Sperti to Archbishop John McNicholas, a vocal advocate for “Catholic science.” Seeing an opportunity, McNicholas recruited Sperti to head a new research and education center called Institutum Divi Thomae (IDT), setting up his new science star in two East Walnut Hills mansions. Sperti took much of the staff at the Basic Science lab with him, including a scientist named John Loofbourow. According to University of Dayton history professor John Heitmann, who wrote a short history of IDT, thanks to McNicholas’s intervention Sperti was named by Pope Pius XI to the Pontifical Academy of Sciences in 1936, joining such august members as physicists Niels Bohr and Max Planck, and geneticist Thomas Hunt Morgan. Sperti hobnobbed with local grandees like J. Powel Crosley, a fellow serial inventor who also donated money to IDT. Sperti wasn’t shy about making big claims to boost his own reputation. In 1938 he declared that IDT was on a mission to cure cancer; soon newspaper articles appeared all over the country quoting his assurances (“Cancer Cause Believed Found, Sperti Reports” ran one headline in the Times-Star). IDT was designed to run on the same model as the Basic Science Research Laboratory: Funds would initially come from the archdiocese, but over time Sperti’s inventions and patents were supposed to provide the bulk of the financial support. Sperti’s scientific output was remarkably small given his outsized reputation, but there were plenty of inventions. On his own or as part of a team he applied for numerous patents: a way to use UV light to tenderize meat (Kroger later employed this process to market “Tender-Ray” beef), an anti-strobing-effect fluorescent light, concentrated milk, frozen orange juice concentrate, a powdered form of orange juice (akin to Tang), and additional sun lamps and bulbs. These were assigned to IDT, though few, with the exception of the sunlamps, ever made much money. When the Cocoanut Grove nightclub in Boston burned down the following month, killing 492 people, Sperti made headlines when he air-freighted 100 pounds of Bio-Dyne to Boston-area hospitals to help treat the wounded. By the middle of 1943 he was marketing it as “Sperti Bio-Dyne Ointment” in major magazines. Another product called Skin Respiratory Factor was sold as a beauty cream using the tag line “Now! A fresher, more radiant loveliness for ‘AFTER-30’ skin.” In fact it was just Sperti Bio-Dyne placed in cold cream jars. Later, when reports came in of people using the stuff to treat their “piles” (a.k.a. hemorrhoids) and finding relief, Sperti redesigned the packaging and renamed it Preparation H.
In one instance, Sperti, who had come to believe that marine organisms could be harnessed in the fight against cancer, convinced the Archdiocese of Cincinnati to purchase a beachfront resort and casino in Palm Beach, Florida, called the Oasis Club and turn it into IDT’s winter home and “marine lab.” The property was appointed with fine furnishings, some of them gifts from wealthy Palm Beach society figures. As it turned out, the scientific proof that Preparation H and Aspercreme really did what they claimed to do was elusive. In 1966 the Federal Trade Commission demanded that American Home Products stop telling consumers that Preparation H could shrink hemorrhoids or aid healing. It also demanded that it stop using the word “bio-dyne.” Today, the version of Preparation H sold by Pfizer does not contain the “live yeast cell derivative” of the original, though some overseas versions do. In the end, an ugly battle developed among the investors in the various corporate entities that helped support the institute and it shut down in 1988. Today Amy Miles runs what’s left of Sperti’s empire, a tiny company called Biologics International based in Florence, Kentucky, that makes the yeast cell derivative that started out as “bio-dynes.” Biologics ships the stuff around the globe, where it’s put into Preparation H.
As for the rest of humankind, well, we’ll always have vitamin D. According to the National Institutes of Health, experts say most of us can make pretty much all we need simply by getting out into the sun for 10 to 15 minutes a few times a week. Just as Harriette Chick recommended. Originally published in the October 2013 issue.